I rarely make Paneer at home.Contrary to what people say about store bought Paneer being hard and tasteless,I find them quite good.Most of the times,soaking the paneer in hot water before adding to the curry does the trick for me and the paneer stays soft even when I reheat the curry.So I might be just lucky to get good quality Paneer or maybe I haven't come across those 'really hard and tasteless' paneer' yet! On those occasions when the milk curdles,I end up with Homemade Paneer and I try to incorporate it into Stuffed Rotis or Paneer Bhurjis.Ever since I came across Aparna's recipe for Paneer Pound Cake,I've been waiting for my milk to curdle to try this out. [Ok,I could just go ahead and curdle the milk myself,but I preferred to wait].The recipe is a very simple one and gets done in a jiffy if you have the paneer ready. 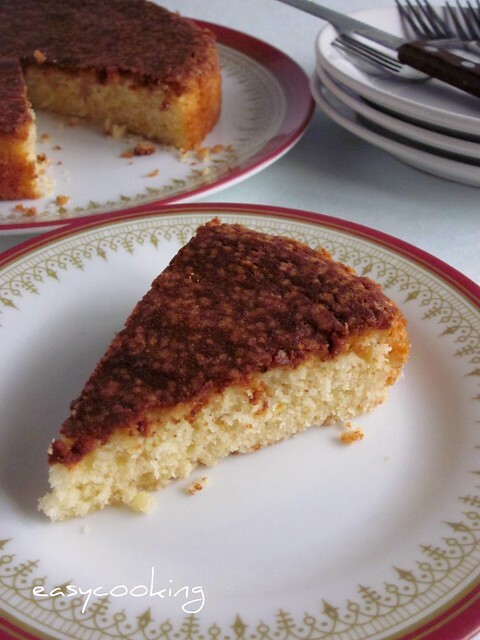 It smelled so good while baking that I just couldn't wait to cut and eat it.The texture is very soft and melt in the mouth.It is more like a simple tea-cake you can have with your cuppa.Do try it out since unlike Pound cakes,this one is not loaded with pounds of sugar and butter!! Grease and line an 8' round cake tin. Sift together the flour and baking powder,keep aside. Make a smooth paste of Paneer by blending it in the mixer. Cream the paneer and the butter till soft and fluffy. Mix in the sugar and beat till the mixture is creamy.Scrape down the batter from sides of the bowl in between. Add the egg and vanilla extract and beat well till mixed. Spoon in the flour mix and beat on medium speed till you get a smooth batter.Add the lemon juice and beat again.The batter might look slightly curdled,but that's alright. Pour the batter into the prepared tin and bake for 30-35 minutes or till the top has turned a golden brown and a toothpick inserted into the cake comes out clean. Cool the cake in the tin for 5 minutes and then gently transfer to a wire rack for further cooling. For this cake,it is better to use homemade paneer.For making your own,refer Aparna's post for detailed steps. I used a 8' round cake tin and felt my cake was thinner than Aparna's,so planning to use a smaller tin next time. [I like tall cakes!]. If you have access to store bought Ricotta,you could substitute that with Paneer. Perfect looking cake dear.... nice recipe... YUM! good recipe..will try it sometime..sounds like the mawa cake..I think you can skip the egg,isn't it? Me too prefer store bought paneer .. This cake sounds amzing,should try out sometime! awesome and moist lovely cake. A very interesting ingredient and would be a great Tea Time snack. hmmmmm...this sounds awesome. I cant wait to bake this one and esp since its healthier too. Great pics too divya. as always I love visiting your space. So Moist n Fluffy!!!! Looks so yummy!!! POund cake with fresh paneer looks super yummy and marvellous..
That is one delicious cake, looking at the slice makes me long to grab! Wow!!! a cake with paneer? lovely and the cake looks very moist. Oh yes! Paneer tastes just fabulous in a cake! I absolutely loved it in my cream cheese bundt. This looks and sounds delicious! 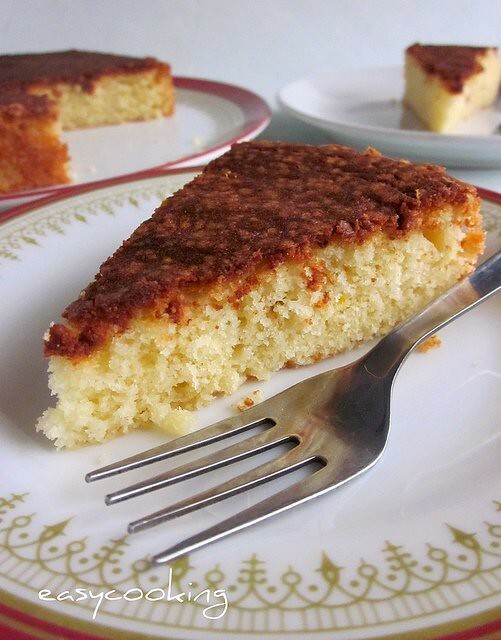 Have you seen Hetal & Anuja's take on Ricotta cake? Looks so tempting...Sure do try this with ricotta...I have some ricotta and cake mix..
Its one of my favourites and am glad you tried it out. Must say the crumb of your cake looks beautiful. The pound cake looks delicious, very moist..
Wow! the cake definitely looks delicious! Must try it sometime! I made this cake by waiting for the milk to curdle like you did. Didn't have the heart to forcibly curdle milk. I made a few variations to your recipe. The came our very delicious but I felt it was a li'l extra sweet. Next time I'm gonna reduce the sugar content. i tried this cake out 2day,n mmmmmm...deliciously soft n crumbly n lvely flavour! !although it didnt rise much,its a piece f melt in de mouth cake!luvd it!thx a million!! i used fresh paneer by the way! your recipes and the pictures with them are really very informative and lovely. I wanted to know the difference between cream cheese, ricotta and cottage cheese.